Fruit can be included in a diabetes-friendly diet. Fruit is full of good nutrition—vitamins, minerals, fiber, and disease fighting antioxidants. It tastes good, is refreshing, filling, and adds beautiful color to your plate. The key to eating fruit is to choose the right kinds and appropriate portion sizes. Because they can contain high amounts of carbohydrates that can affect your blood sugar levels, you cannot eat unlimited amounts of fruit. What are the best fruits for diabetes? This can be a hard question to answer since people with diabetes adhere to varied diets and philosophies when it comes to diabetes management with food. In addition, a person's blood glucose response can vary based on the type of fruit, the ripeness, and the components of the meal. While some people use exchange lists and carbohydrate counting to meal plan, others stick to low-glycemic diets or low-carb diets. When it comes to fruit, The American Diabetes Association suggests that you choose fruits that have a low glycemic index. The glycemic index, or GI, is used as a reference to measure how a carbohydrate-containing food raises blood glucose. Foods are rated based on how they raise blood sugars in comparison to a reference food such as sugar or white bread. A food with a high GI will raise blood glucose more than that of a food with a medium or low GI. Below you'll find some of the best fruit choices for diabetes—these fruits allow you to consume a larger portion for fewer carbohydrates and calories, and more fiber. Raspberries: With merely 15 grams of carbohydrate (1 fruit choice) in one cup serving, raspberries offer the highest amount of fiber of any berry, a whopping 8 grams. Fiber is the indigestible carbohydrate that helps to pull cholesterol away from the heart, helps you to feel full, and also slows down how quickly blood sugars rise. Raspberries' ruby-red color comes from anthocyanins. Research suggests that anthocyanins may help fend off certain chronic disease, including cardiovascular disease. Blackberries: They contain about 15 grams of carbohydrate in a 3/4 cup serving. As with raspberries, they have anthocyanins, as shown by their deep purple hue. Cranberries: There are 15 grams of carbohydrate in one cup of fresh cranberries. Studies have shown that cranberries may help lower LDL (or bad cholesterol) and raise HDL (or good cholesterol) levels. Use caution when purchasing cranberries because sugar is often added to cranberry products to make them taste less tart; read labels and avoid cranberries with added sugar. Strawberries: There are 15 grams of carbohydrate in 1 1/4 cups. That's a hefty portion. Strawberries are lower in calories and have three times more vitamin C than the other berries. In addition, one cup of strawberries has almost as much vitamin C as one cup of orange juice. They also contain folic acid, are rich in potassium and are packed with antioxidants, such as anthocyanins, and quercetin. Blueberries: There are 15 grams of carbohydrate in 3/4 cup. Blueberries are the berry with the most antioxidants and contain flavonoids and resveratrol. Apples: A small apple (about the size of a tennis ball) delivers roughly: 60 calories, 16 grams of carbohydrate and 3 grams of fiber. It's also a good source of vitamin C, which acts as an immunity booster and aids in wound healing. Additionally, apples contain quercetin, a type of phytochemical known as a flavonoid, which is found in the apples skin and may have anti-inflammatory properties. Apples also contain soluble fiber—the kind that helps keep you full, slows down the absorption of nutrients (such as sugar) into your bloodstream, and may reduce your cholesterol. Soluble fiber is also thought to have an anti-inflammatory effect that may help people with diabetes recover faster from infections. Lastly, apples are full of polyphenols, plant compounds that seem to protect against a variety of chronic diseases. Pears: Pears are a high fiber fruit choice that holds up well in transport—making for a good, portable snack. Pears also take on flavors well and can be added to salads, sides, or protein dishes, adding fiber and a hint of sweetness. Pears contain a large amount of fiber, about 22 percent of the RDA in one medium sized portion. If you are trying to keep your portions of carbohydrates at bay, aim to eat small sized pears or cut your medium one in half. One small pear contains about 85 calories and 22 grams of carbohydrate and 5 grams of fiber (18 percent of the RDA). Grapefruit: Clocking in at only 41 calories for half the fruit, grapefruit is low-calorie, naturally sweet, and flavorful to enjoy on its own. It is rich in vitamin A and C. Pink grapefruit contains the antioxidant lycopene, which gives it its' beautiful pink hue. Lycopene may increase HDL (healthy cholesterol) and reduce LDL (bad cholesterol). Grapefruits contain flavanones, a subclass of flavonoids. Flavonoids have been shown to exhibit antiinflammatory, antithrombogenic, antidiabetic, anticancer, and neuroprotective activities through different mechanisms of action in vitro and in animal models. Note, if you are taking medications, you may need to avoid eating grapefruit. Grapefruit consumption is not advised if you are taking lipid lowering medications, such as statins, and may also be contraindicated with medications such as antihistamines, blood pressure drugs, thyroid replacement drugs, birth control, stomach acid-blocking drugs, and the cough suppressant dextromethorphan. Ingesting grapefruit with these medications can cause the body to metabolize these medicines abnormally. If you have any concerns, discuss your medicines with your doctor before consuming grapefruit. Tangerines: One small tangerine contains 40 calories and 9 grams of carbohydrate, fewer calories and carbohydrate than a typical serving of fruit, which contains about 60 calories and 15 grams of carbohydrate. Tangerines also contain 1.3 grams of fiber, contributing to about five percent of your daily needs, making them filling and satisifying. Oranges: One small orange contains around 62 calories and 15.4 grams of carbohydrate. Keep in mind that larger portions will contain more calories and carbohydrate. Therefore, if you purchase very large oranges, you may only want to eat half in one sitting. If you aren't sure about the size you can always peel the orange and weigh it. One serving will weigh roughly four ounces. Oranges are an excellent source of vitamin C, more than grapefruit, packing in more than a day's worth in one small serving. Oranges are also a good source of potassium, thiamin, and folate. Potassium can help to lower blood pressure. Fruit is a healthy source of carbohydrate that can be included in a diabetes meal plan. The best types of fruits for diabetes are those that contain large amounts of fiber and have a lower glycemic index. These fruit choices will have more favorable affect on blood sugar, while also providing vitamins, minerals, and antioxidants. Even the healthiest fruit choices need to be portion controlled, so make sure to always note the serving size. Basu A, Du M, Leyva MJ et al. Blueberries Decrease Cardiovascular Risk Factors in Obese Men and Women with Metabolic Syndrome. The Journal of Nutrition. 2010;140(9): 1582-1587. Basu A, Lyons TJ. 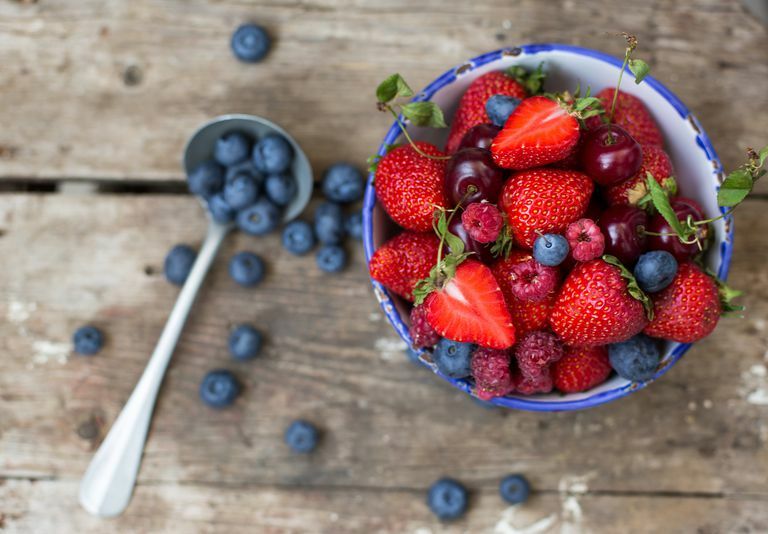 Strawberries, Blueberries, and Cranberries in the Metabolic Syndrome: Clinical Perspectives. Journal of Agricultural and Food Chemistry. 2012;60(23):5687-5692. doi:10.1021/jf203488k. Novotny JA, Baer DJ, Khoo C, Gebauer SK, Charron CS. Cranberry Juice Consumption Lowers Markers of Cardiometabolic Risk, Including Blood Pressure and Circulating C-Reactive Protein, Triglyceride, and Glucose Concentrations in Adults. Journal of Nutrition. 2015;145(6):1185-1193. doi:10.3945/jn.114.203190. Wallace TC. Anthocyanins in Cardiovascular Disease. Advances in Nutrition: An International Review Journal. 2011;2(1):1-7. doi:10.3945/an.110.000042.